The Kirby series has been a staple of Nintendo game systems since the pink fluff first appeared on the original Game Boy back in 1992. While the games have always been known more for their charm and unique gameplay than their difficulty, they've become some of the best selling video games in history. 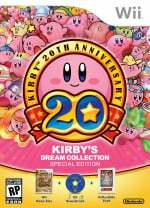 Now Nintendo has released Kirby's Dream Collection: Special Edition, a compilation of six of the most popular Kirby games along with a set of collectibles, to celebrate 20 years of a fun franchise that's still going strong today. For the most part all each game plays very similarly and will be instantly familiar to fans of the series. The two original Game Boy releases — Kirby's Dream Land and Kirby's Dream Land 2 — and Kirby's Adventure for NES offer the familiar inhaling enemies and items. Then as the games progress across the various Nintendo systems, through SNES's Kirby's Dream Land 3 and Kirby Super Star, the depth and presentations become more intricate and varied, especially for Kirby's first 3D outing, Nintendo 64's Kirby 64: The Crystal Shards. The emulation is top notch and even the scaled up Game Boy and NES releases still look quite good and play just as they always did. The collection gives you the option of using the Wii Remote on its side, the Classic Controller or even the Gamecube controller, so there's plenty of choice depending on your preference. Selecting the games is a breeze with the simple menus, but quitting them can be a bit of a pain as you have to press the Home button and click Reset to go back to the main game menu. It's equally quick and easy to peruse the Kirby museum gallery, which details the history of the games as well as tossing out interesting tidbits of actual real life historical data to go along with it. Since this is a collector's edition, you get a few little goodies outside of the game itself too: namely a beautiful little full colour history book on the games and a 45 track soundtrack CD spanning the entire series. Although the book is a little flimsy, it contains a heaping amount of unique fun facts about the games and how they were created, while the music CD is chock full of amazing Kirby tunes complete with a few interesting remixes. For all of the bonus materials and extras inside the package, the best would have to be the new Challenge Stages. Not only do you get some gorgeous modern visuals, but the gameplay and challenge is exceptional. You start with one ability and have to use said ability to work your way through the level, defeating enemies and collecting coins for points. Most of the platforming and enemies in these levels revolve heavily around the specific ability given. But what makes these challenges so much fun is the time limit imposed on you and how you're graded on your performance upon completing the level. Not only is it a blast to complete the levels initially, there's plenty of incentive to go back and try to pick up items and defeat enemies you may have missed the first time around. The visual quality varies quite a bit between games given that the they span a whopping 20 years worth of game systems, but there's plenty of artwork and flashy visual touches to keep things interesting, not to mention some beautiful visuals on the Challenge Levels. The same can pretty much be said of the musical presentation, but even the original Game Boy titles still feature some of the best musical tracks of the entire series and sound as great as ever on this compilation. 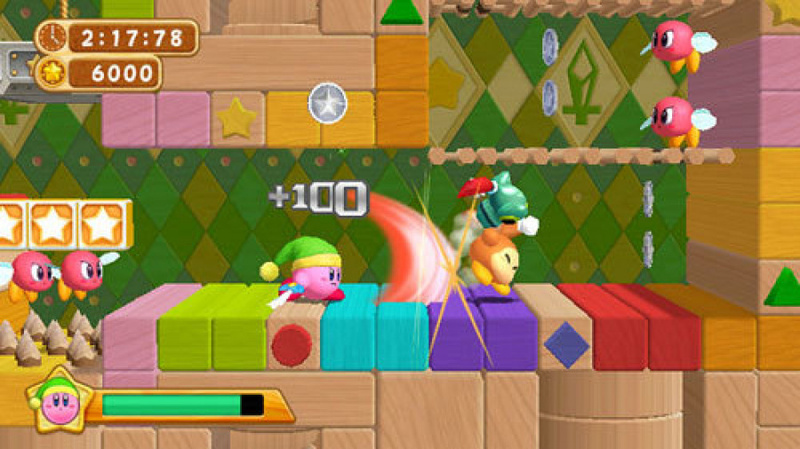 There will inevitably be Kirby fans who will complain that more Kirby games weren't included or that none of the titles got any type of visual makeover, but it's difficult to complain too much given how many amazing Kirby titles have been collected onto one Wii disc, not to mention the fun bonus items and mini games that are also included. No doubt most Nintendo fans will have already played these games many times over, but it's still nice to see Nintendo giving their fluffy protagonist a little fanfare for 20 years of charming gaming magic. Glad to see this one came out good! Despite missing a few of the non-platformer Kirby games I still think this is one of the best compilations out there. It's certainly better than what Nintendo offered with their Mario 25th Anniversary compilation. That didn't even include SMW in the pack, which is just stupid imo, considering there was a All-Stars compilation with that game included on the SNES. I'm very glad to hear that this collection is a more successful effort than Mario's 25th Anniversary, but not being a fan of Kirby games I'm going to give this a pass. Had this treatment been given to Metroid during it's recent anniversary I would have been delighted. Damn you Nintendo! Damn you! If they had included some of the old spin-offs (like Pinball Land, Block Ball, Avalanche, Tilt 'n Tumble, etc. ), then I would definitely buy this art some point. I already own most of the games on this collection, and I never cared much about art books or soundtrack CDs, so there's not much here for me. @PixelatedPixie Metroid honestly doesn't have very many older games. If they had released a collection, it probably just would have been 4 or 5 games. I love the little pink guy! This is an absolute must have for me. I sure hope Europe get this before the end of the year. It would make a great christmas present. Like with SM All-Stars, I got this day one. I'm very pleased with my purchase this time around. Yeah, they could have easily released Tilt 'n' Tumble with Wiimote motion tech (or 3DS VC as well), but overall I'm much more impressed with this offering than the Super Mario AllStars demake (Without SM World like I've got for SNES), and Mario 64 with some bonus materials would have been a nice gesture, but Kirby makes up for everything Mario lacks! I'm loving this package! It just feels really well done, the book is fantastic, and I really appreciate Nintendo making sure all the games can be played with just the sideways Wiimote - no need to plug in the CC or GCN controller for Kirby 64! Hoping you guys get this in Europe & down under ASAP! On the fence with this one, I like the sound of the extras, but I already own all these games, so I just don't know, lol. I'll certainly get this game if it comes over to Europe. But yeah, it wouldn't be the first time if Europe would get the sack in a release. I'll have to pass on this, have most of them on VC. They should have released this earlier. 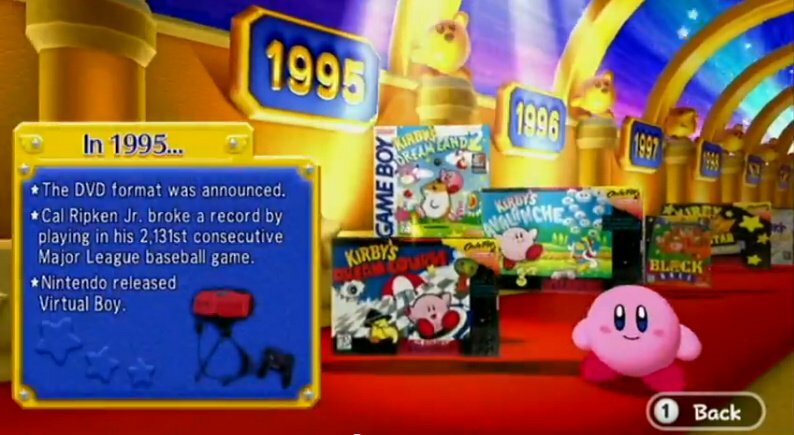 The wii's been out for so long that all the Kirby fans would have bought the virtual console games and wouldn't need this collection. I still got it (today!) anyway. Did you know that according to the included booklet, Dream Land 2 and Star Stacker are available on 3DS virtual console? Wow! Hopefully this stays in stores through Christmas, as I might just ask for it then. It looks really great, and I would mainly be getting it for the art booklet and soundtrack to be honest. Own every single one of these games... yet I must have this! Great review, Corbs! I already got my copy days ago and will play it once I get over this d*mn cold! Why was the Kirby puzzle game, Super Star Stacker, not included in this collection? That was the only Kirby game I never got to play. Still no European release-date! Big shame on Nintendo!! I heard the controller doesn't rumble in Kirby 64? Is that true, Corbie? @Henmii Seriously? It's difficult to understand what companies seem to think a nation's demographic wants. Yet another reason region-locking is bad. 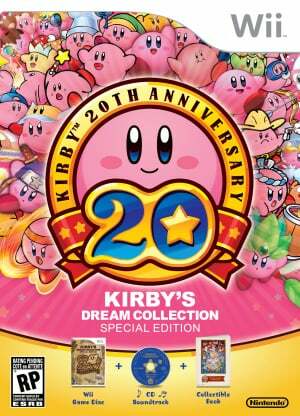 I don't get why they called it Kirby's dream collection: Special edition. Why not just Kirby's dream collection? If this is the special edition, what's the regular edition? I only have Super Star and Dreamland, but I did not hesitate to buy this one. As with Mario's, interested in the booklet, CD and collector's nature of this item. It is great to have the three anime episodes as well. As far as I know Kirby games do sell pretty good in Europe, so I don't see a reason why this collection shouldn't come to Europe! But sadly there is still no date! If it doesn't arrive during Spring 2013, then Nintendo makes a huge misstake! And you are right: Region locking IS bad!! Meh, I already have Kirby's Adventure, Kirby's Dreamland, and Kirby Super Star on the VC. I'd rather have the digital versions, since they'll probably carry over to whatever console comes after the WiiU whereas Wii games won't work anymore. I think that's the better investment, if you're just interested in playing the games. 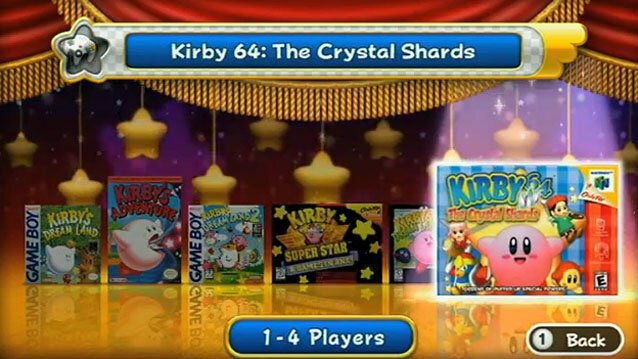 All the kirby games in one disc. I am SO getting this! This is probably going to end up on my Christmas list. After having played most of the collection, I have to complain that Super Star and Dream Land 3 use different controls than the other 4 games. It's somewhat justified because the controls are the same as in the VC versions, but it's still annoying and worth a mention. At least the controls in Super star and KDL3 aren't broken like SMW. Why an 8/10? This definitely deserves a 9/10. Otherwise, this was a nice review. I owned this game, but I learned that I just don't like Kirby games....I traded it in, and in the end I'm not mad I traded it in. I mean the games are not even in full screen.....that was a big flaw for me in this collector's package. Looks and sound like a great game. Nice! Probably going to pick this collection up before it is too late! Got this one for Christmas, last year, and I love it to pieces. It was either twenty or thirty bucks at K-Mart, I'm told. Is it worth this coming to Wii U VC when the games are already on the VC? The GB games are on the 3DS VC.